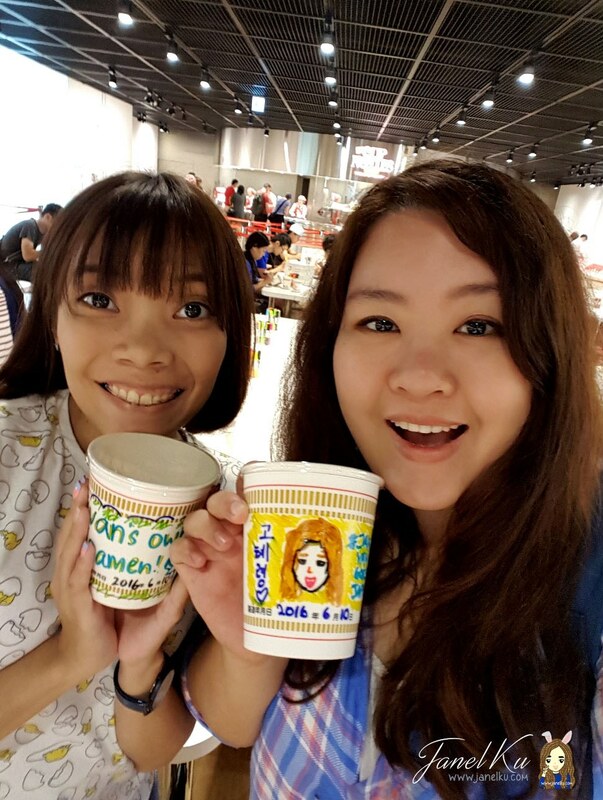 So, it was a bright and sunny day when we decided to pay a visit to the Momofuku Ando Instant Ramen Museum! Our mini adventure began when we arrived at Ikeda Station, and we were a little lost so we approached the counter staff for some help as my GPS was going out of whack. He proceeded to give this slip of paper to us and we tried hard to interpret it, but gave up and burst out laughing (yes, we are 2 optimistic people). What in the world are these treasure hunt instructions saying?! Anyhoo, we decided to proceed with our gut feel and trailed behind a couple who looked like tourists. Thank goodness, it turned out to be a right decision and the museum wasn't very far from the station. Along the way, we came by many good looking houses, with lovely flowers lining the road; a great treat for our eyes! About 5 minutes later, we arrived at the museum! 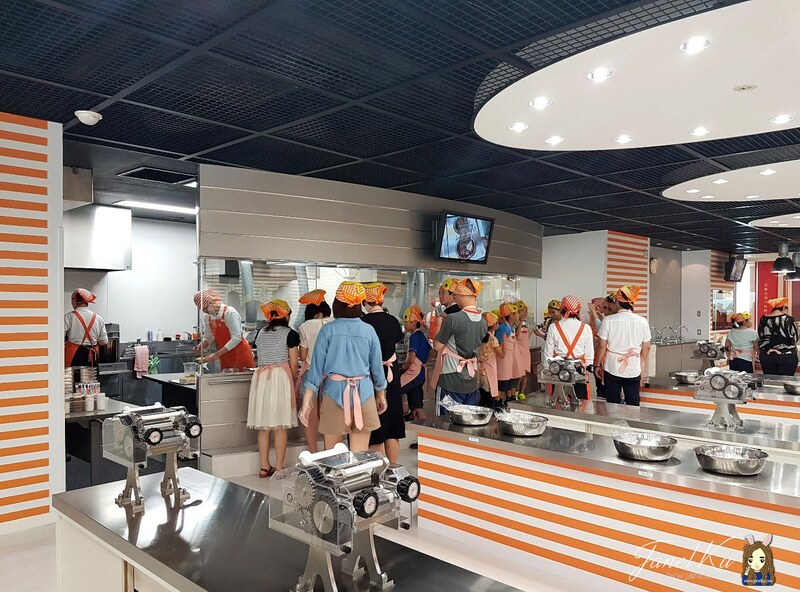 This museum is special because it gives insight on the history of the popular instant ramen, how it was created and also, you can participate in making your very own packet of instant noodles! 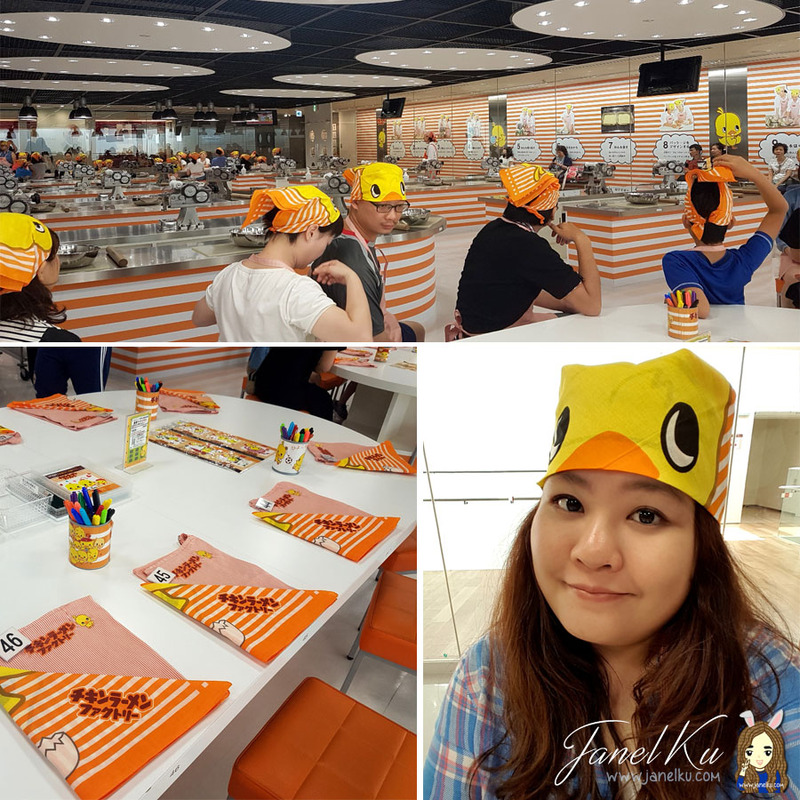 Once we arrived at the museum, we first made our way to the information counter (where the museum shop is located), to register ourselves for the Chicken Ramen Factory workshop, with my online reservation slip. They also showed us an English workshop instructions card. Here it is. More about the workshop below. Those who wants to learn more about Instant Noodles and their history can also borrow audio sets in English and Chinese from the info counter. 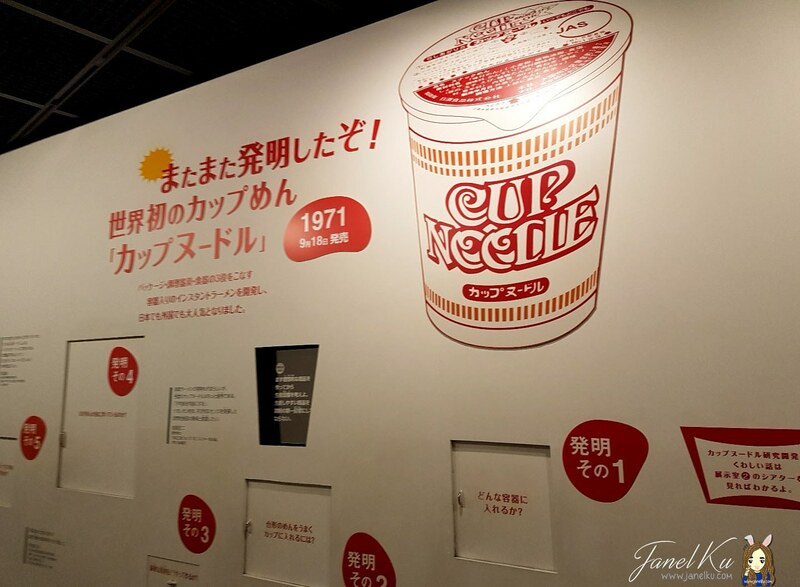 The audios give narrations of the Birth of Chicken Ramen exhibit and the CupNoodles Drama Theater. Prepare 2,000yen to rent the audio set, and they will reimburse you the money when you return the audio set. 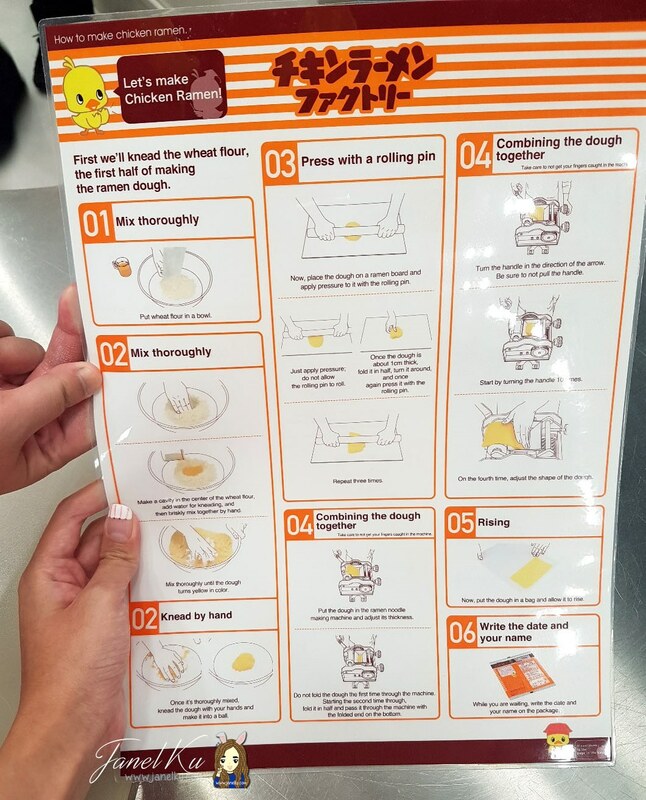 Before you make your way out (if you need to get a souvenir), you can purchase original goods of Hiyoko-chan (the Chicken Ramen mascot) and the instant noodle package logos, as well as gift sets of instant noodles, and books about the creator, Momofuku Ando and well, cups of instant noodles. Next up, we head to read more about the history and view the evolution of instant noodles packaging in The Instant Ramen Tunnel! This guy, known as Momofuku Ando, had invented the instant noodles all on his own, using simple tools he had in his home. Really impressive. I hadn't known this, but more than 100 billion servings of instant noodles are consumed worldwide each year! Wow~! We stood at the exhibition hall pointing out which packaging were our favourites. Some have extremely hilarious designs, which I'll leave for you to explore youself when you visit the museum. Next up, we visited the My CupNoodles Factory. Yes, it's literally called 'My CupNoodles' Factory. 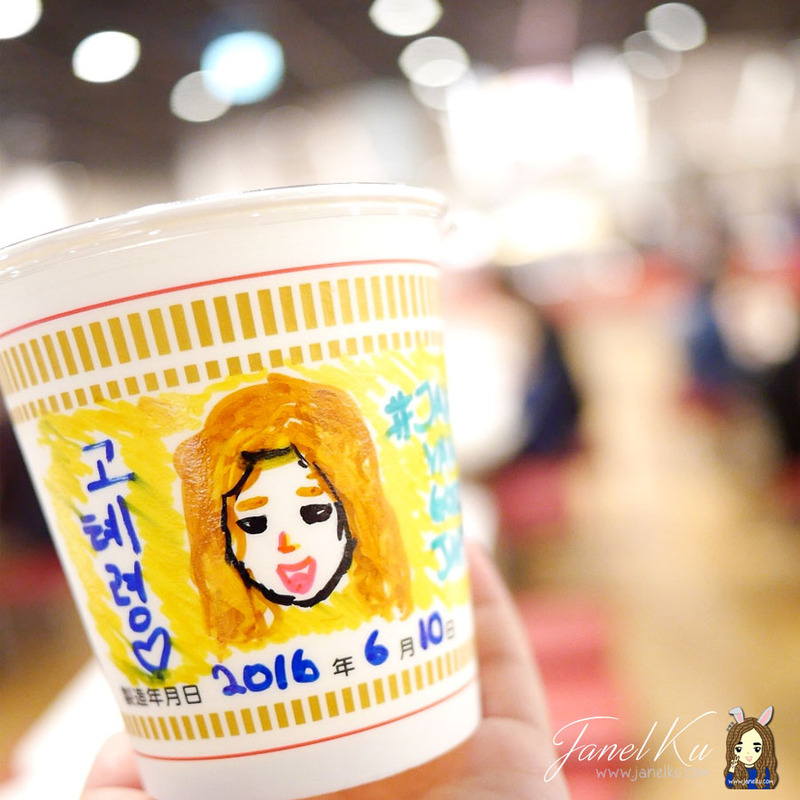 Here's where you can create your own CupNoodles package in a cup designed by you (using coloured permanent markers) and then select your favorite soup from among four varieties and four toppings from among 12 ingredients. Being suckers for this sort of entertainment, we each bought a cup, which costs 300 yen to make. This place is open from 9:30am to 4pm (no entry after 3.30pm), so be sure to come by to customise your own noodles. Don't worry too much about getting lost and not knowing what to do. That in itself is an experience. And you'll be guided along, so just relax and have fun! Us with our own decorated cups. After a couple minutes of deliberating, I finally made my choice and my noodles are ready to be sealed! For those who don't want to immediately cook and eat their noodles, they can package it in a nice (and tight!) air bubble container, string it and bring it home safely without it the noodles cracking up inside. The Japanese are extremely thoughtful to their customers in that sense! Love that. Phew! It was a long session, and boy - Miss Van is tired! 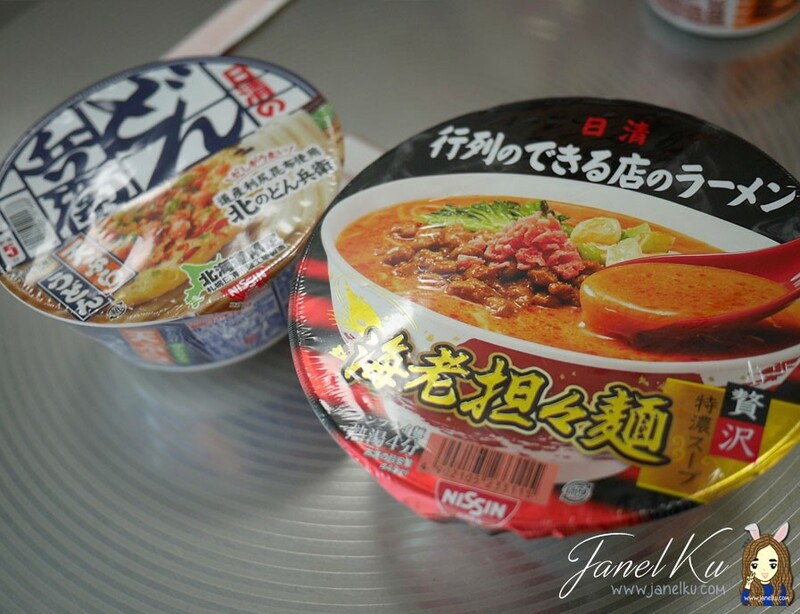 Basically, here they sell more than 20 instant noodles here via vending machines, and it includes popular newly released products and limited-edition products from Hokkaido and Tohoku. Yes, even those products which are not usually sold in Osaka, such as products sold only in limited areas of Japan, can be purchased from vending machines and enjoyed in the dining area. Strictly, no outside food are allowed. And one thing's to love about Japan - their recycling system. Once you're done with the food, recycle at their special bins that allow you to pour the leftover soup (and noodles, if any) in one bin, and recycle the cup in another bin and the wooden chopsticks in another bin. Phew, that sounds like alot of bins! Anyhoo, you can find these bins right next to the vending machines. If you just wanna buy some vending machine instant noodles, by all means, take 'em home. The area is a small place, about a couple of tables, first come first serve. According to their website - 40 seats. Didn't look that many, but, sure. I bought these expensive looking instant noodles without even knowing what they're saying, but daymn, it tasted good! All you have to do is reserve early (only up to 3 months ahead), but you have to register with a friend because the workshop is conducted in pairs. We took the 2.30pm class and by the time the workshop has ended, the museum was also closing (already 4pm!). Oh, if I forgot to mention, I paid the registration fees for the workshop when I registered at the info counter. Paid 1000yen for the 2 of us. Every participant receives a Hiyoko-chan souvenir bandana! My head was not made to look swag in bandanas. But Hiyoko-chan is so cute! I wasn't expecting this to be honest, and I was prepared to go through the class in Japanese. But it was a pleasant surprise when they presented us a card with English instructions, and assigned us a staff who knew some English (very minimal, but still, awesome). 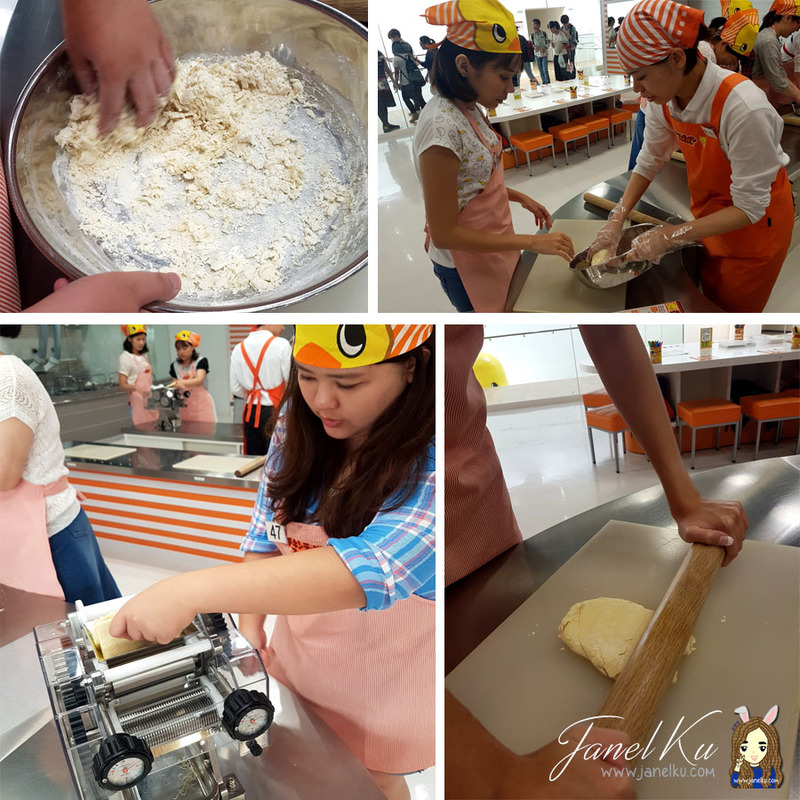 We kneaded, we molded, we rolled some pins and the instant noodle flour took a good flattening from the noodle machine. 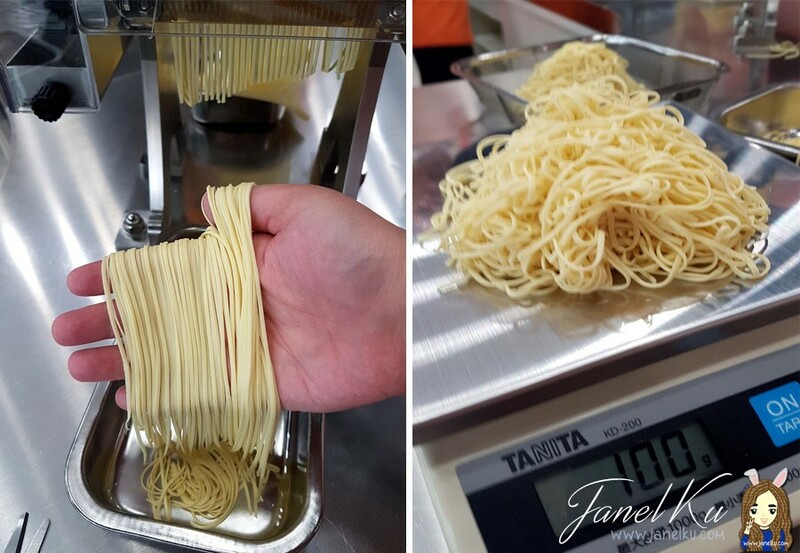 After it's cut to pieces, we had to make sure to measure the noodles, specifically 100grams. No more, no less (so specific). 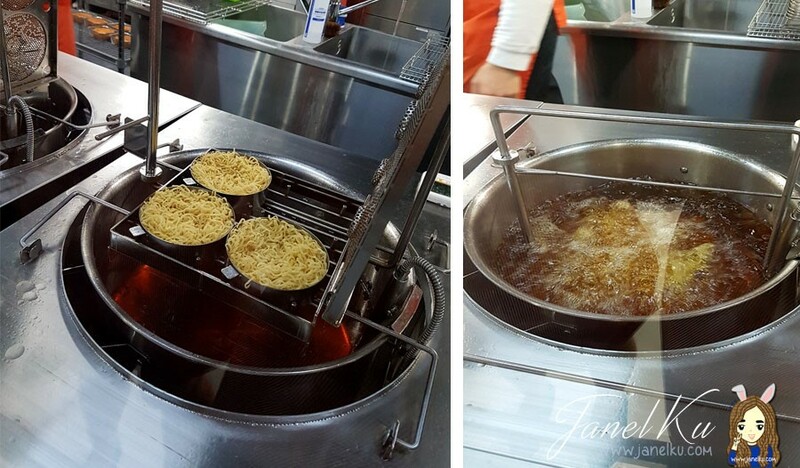 The noodles will be placed into a numbered tray and sent to the kitchen for deep-fry preparation. 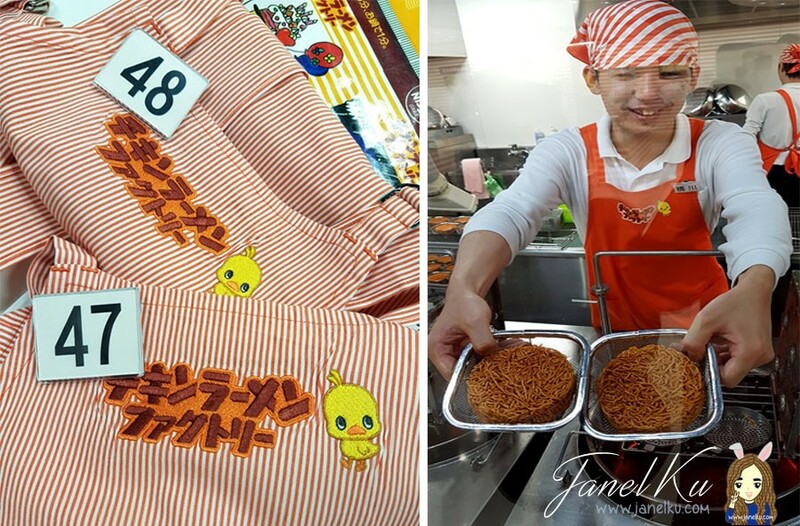 All aprons come with number tags, so remember your own number, because that's how they'll identify your readied deep-fried instant noodles for packing! 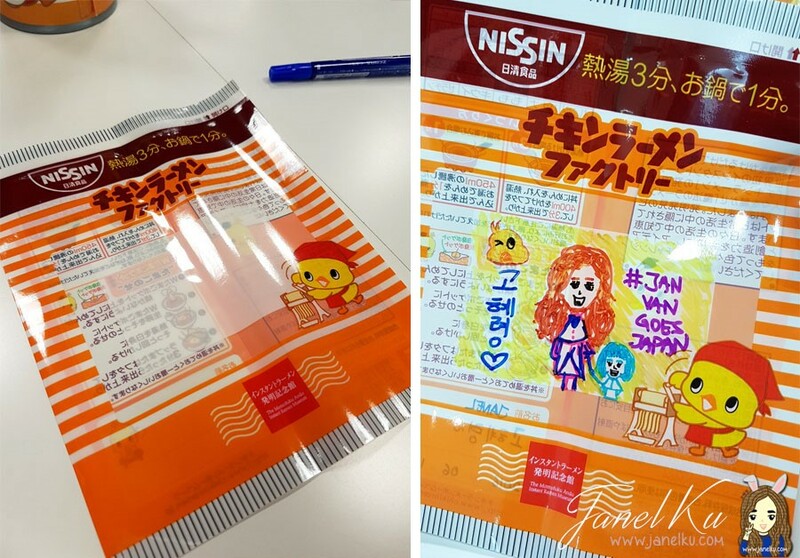 All noodles go into a pretty package (also drawn and designed by yourself) and it'll be machine sealed until you want to eat it! Mine is still well sealed and I can't bear to eat it... so it's still sitting in a display shelf in my home. I don't think I'll ever eat it. Because it's a precious momento. haha. We had a really fun time here, so it's definitely a place you can consider visiting when you're in Osaka. Just remember to allocate about half a day (about 4 hours) in this place, especially if you're participating in the workshop!